Patrick Vaill delivers a knockout performance as the sensitive, brooding, and lonely Jud Fry in the critically-acclaimed, must-see Broadway revival of Rodgers & Hammerstein's Oklahoma!. Watching his reaction magnified on screen as Curly sings "Pore Jud is Daid" is one of the most haunting and moving parts of the entire evening. 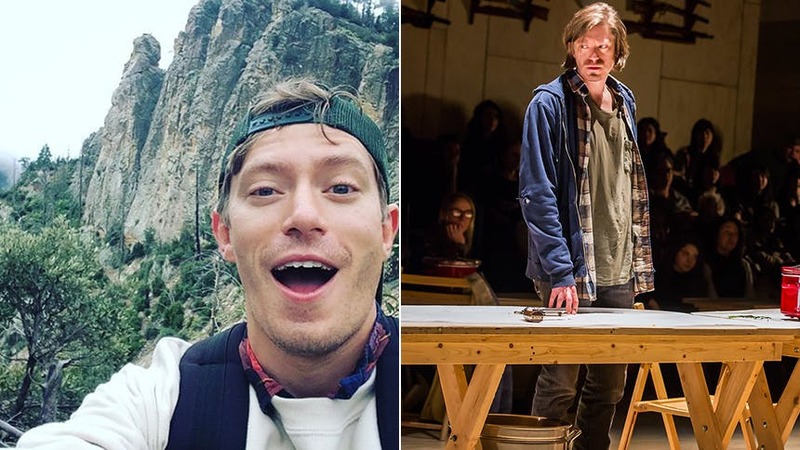 BroadwayBox gets to know Patrick a bit better as he talks with us about his 12-year journey with this production of Oklahoma!, the cast recording his wore out (twice!) growing up, and his passion for cooking. 1. You’ve been part of this production since the beginning. What were your first discussions with director Daniel Fish like about the vision and about Jud? I don't actually remember a lot of discussion! What I remember most was a very patient coaxing. Gently urging me to let go of any preconceptions I may have had about who Jud was or what he looked like or how he moved and finding something that was honest and rooted in the text. It's been a very lovely twelve years with this material. 2. How do you humanize Jud? What do you love and respect about him? I think it comes from approaching him freshly—like I said before, without any preconceptions that he's a villain or scary or anything else like that. When you look at him as if for the first time, listen to what he's saying, he's revealed as someone longing for connection, longing to be seen. Someone who is desperately alone. I can't think of anything more human than longing for connection, so he's always been that to me. 3. What do you listen to pre-show? How do you get yourself into Jud’s space? It depends on the day, but “Harvest Moon” by Neil Young and “Hello Darlin'” by Conway Twitty are pretty consistent helpers. 4. What is the thing you hear most often after friends and family see the show? 5. Tell us a memorable audition story. Oh god. I often try to forget them as soon as they're over, but when I auditioned for Yale I thought I was leaving the room after doing my pieces but in fact walked into a closet. And shut the door. And then had to open it. And find the actual door. I didn't get in. 6. What was the first musical you were totally obsessed with growing up? I saw the Lincoln Center revival of Carousel when I was nine and I still remember the feeling in the pit of my stomach during it. I was completely awed by it. And I wore out my CD of Hedwig. Twice. 7. What is something you feel passionately about outside of performing? I'm a pretty good cook and it's my favorite non-performing thing to do. I will talk about it for as long as you want. Probably longer, if I'm being honest. 8. Having grown up in New York, what is your NYC happy place? Central Park. It's the best. Particularly in the evening. 9. What was the most memorable part of making your Broadway debut in LCT’s Macbeth? Working with Jack O'Brien, who is just intoxicating to be around, and Ethan Hawke, who means so much to me as an artist and has been a pretty constant source of inspiration over the years. Being around that devotion to the work was heaven. And Anne-Marie Duff's laughter peeling through the halls backstage. The best laugh ever. 10. How do you feel your performance has grown and changed over 12 years, from Bard College to St. Ann’s to Broadway? I think it's grown as I have grown. I was a kid and now I'm (apparently) a grown man. To live with something for that long, for twelve years, it seeps into you and hopefully gets richer, easier, distilled. It's an unbelievable thing to get to do. I'm so lucky. I know that. Don't miss Patrick Vaill as Jud Fry in Oklahoma! at Broadway's Circle in the Square Theatre.